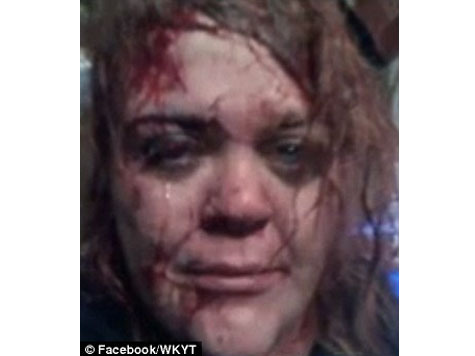 LESLIE COUNTY, KY (WKYT) – “Help please anyone.” These were the words Susann Stacy used to caption a bloody selfie she posted to Facebook Monday night after police say her husband beat her badly with a gun at their Leslie County home. Susann Stacy told the Leslie County Sheriff’s Office that her husband beat her with the handgun after overhearing her on the phone with another man. She says her husband then ripped the phone line out, leaving her with no way to call 911. Her cell phone had no reception but she was able to tap into the WiFi, so she snapped a picture and posted it onto Facebook. One of her friends saw the post and called police. Her husband, Donnie Stacy, was not at the house when deputies arrived but was found nearby and arrested. Deputies also say they found the handgun used in the attack near a tire swing used by the couple’s son. On her Facebook Page, Susann posted the following statement regarding the events. A statement about the events of Monday.. I posted a picture via WiFi because it was my ONLY way to seek help. I didn’t have a phone to call on… no cell service… just WiFi. I just wanted help.. to not die in a pool of my own blood in my kitchen floor. I am thankful for all the help… care… concern… and humanity shown to me. There are so many negative statements being made… along with positive ones… following the news stories. To each their own. Time to find that more better forever. Blessings.